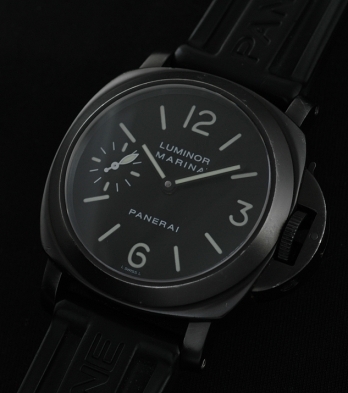 This is a Luminor Marina PAM 04B Panerai PVD coated with all the boxes and papers. This is VERY hard to find. One can search the world far and wide and not find a PAM 04B such as this; with original outer box, papers, etc. There are some very minor marks on the PVD case. Nothing really detracting… just normal use. The PVD buckle and original band are also present. This PANERAI 04B is one “mean” looking watch on the wrist! Bankwire only please. $12,500.